The first example is a passport issued in Vienna on October 19, 1938, to a Chaune Puder. 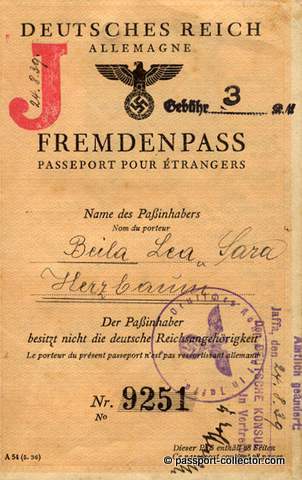 Notice that this passport was issued prior to the date that the name “Sara” had to be included in the names of Jewish women. On April 6, 1939, she was granted a visa in Vienna for the United Kingdom. On May 17, 1939, she was granted a transit visa from the Belgian Counsel in Vienna. She arrived in Belgium on June 6, 1939, and landed in Dover, England on June 11, 1939. Below are thumbnails of pages from the passport. The first thumbnail is the first page from the passport with the red “J” for Juden. The second thumbnail is page 2 of the passport with the picture of Ms. Puder. The third thumbnail is page 8 of the passport with the Belgian transit visa. The final thumbnail is page 9 of the passport with the visa from the United Kingdom. Please click on the thumbnail to see the full image, and then click your back key or “Example 1” in the left frame to return. Visit the website for the original article and see also a gallery of several documents.